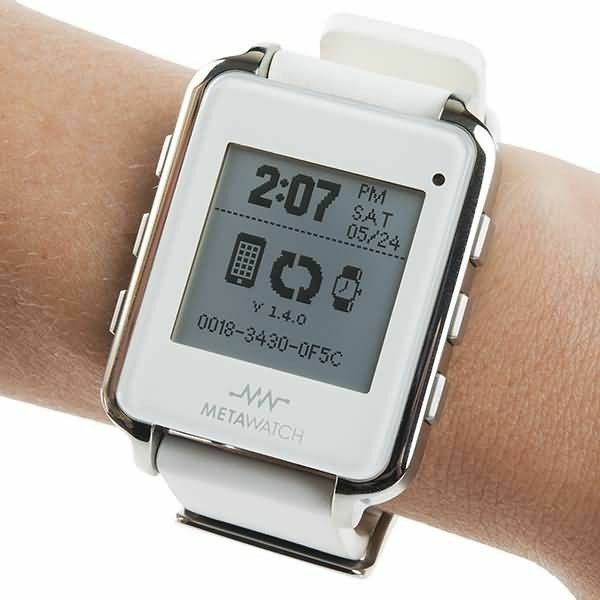 The MetaWatch is brand name of smartwatches developed by Meta Watch, Ltd. Strata MetaWatch and Frame MetaWatch are digital smartwatches released in 2012 funded by raising money via the crowd funding platform Kickstarter. First generation of MetaWatch watches was released as a development system in September 2011. Two models were sold - analog with OLED displays and fully digital. Both are provided with clip for charging, flashing and debugging. For wireless connection Bluetooth 2.1 is used via TI CC2560 module. Second generation have dual Bluetooth 4.0, KXTI9 accelerometer instead of KXTF9, larger battery. Second generation watches are sold under names Strata (model code SW12-1) and Frame (model code SW12-2). Strata has Water Resistant Mark 5 and Frame has Water Resistant Mark 3.